The Brisbane General Cemetery also known as Toowong Cemetery at Toowong, Brisbane was established in 1866 and formally opened in 1875. It is Queensland's largest cemetery and is located on forty-four hectares of land at the corner of Frederick Street and Mount Coot-tha Road approximately four and a half kilometres west of Brisbane. With graving docks capable of accommodating destroyers and fuelling facilities, Brisbane became a naval base during the 1939-1945 War. Upon the entry of Japan into the war fixed defences were provided and manned and American detachments arrived and established themselves there. Allied Air Forces Headquarters, a Central Intelligence Unit and the Headquarters of the G.O.C. in Chief, Australian Military Forces were in Brisbane, and in July 1942 the American Supreme Commander of the Allied Forces South-West Pacific Area, moved his headquarters from Melbourne to Brisbane to be nearer the scene of the operations in Papua and New Guinea. There are now over 250, 1914-18 war and over 100, 1939-45 war casualties commemorated in this site. 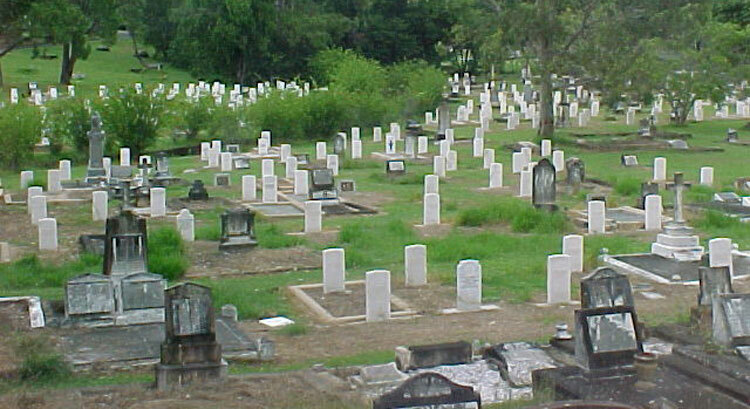 The great majority of the graves are in the Returned Servicemen's Plot in Portion 10.